What did the Shuttle GLS user interface look like? From this video and a bit of guesswork I've reconstructed the display in the attached image. Does anyone know how accurate this is, and what should be on the right side of the screen? - It looks to me like the top section with the timers is constant across all GLS displays, and the lower section is replaced depending on the particular GOAL program you're interacting with (SLP07 in this case). Is this right? - what do the marks under the VFY/MIP/LIP columns signify? I'm assuming the columns correspond to the state of mainline verifies, the mainline interrupt processor and LCC interrupt processors? Does it signify if there's a violation for that milestone? - what does 'ML REVERIFICATION' do? Is it a user invokable action? - I'm guessing the 'BFS' and the top center is indicating the current ops? Should there be a matching 'PASS' mode next to it? - Although it's hard to see in the source image, above 'LAST HOLD' it looks like 'CPERS', which would be 'contingent performs'? Is that indicating whether any CPERS are currently running? - similar to CPERS, I *think* that's 'TB0' in the lower right box, which would be 'Timebase zero'? is that just a display, or is it indicating something else? These are pretty obscure details to be worrying about, but I'm basically looking for any info to make this as accurate as possible. Any insight on what this or other GLS screens should look like or how they behave is greatly appreciated. Topic, this is hard to explain. 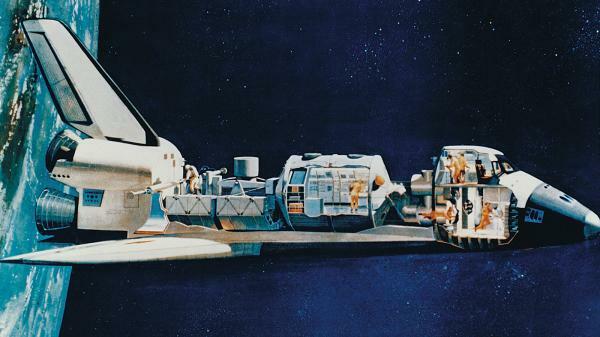 I'm looking for information on the skylab-like units they put in the shuttle bay which they could connect to the hatch and work in a pressurized environment. These units stay in the shuttle bay. Am I thinking incorrectly here and the shuttles launched satellites and/or connected to mir/ISS every mission? Perfect! I think it would be way too much to ask to pressurize the whole bay so I'd think they had units to fit in the bay that were pressurized. Also I've seen the shuttle cockpit and the "locker" room below, so it would be nice to stretch your legs in that sucker. A SpaceHab module is on display at the California Science Center in Los Angeles. 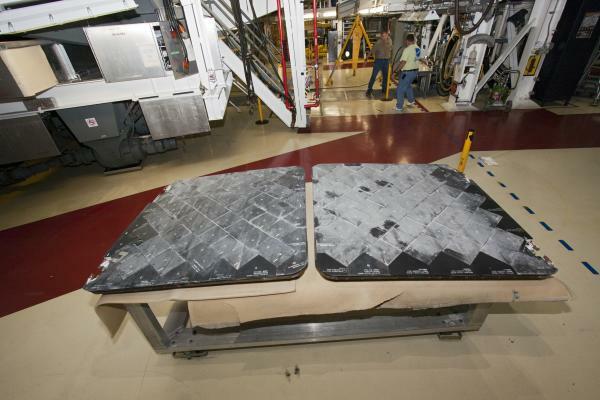 On some missions, two modules were flown together to make a SPACEHAB Logistics Double Module, providing more room for experiments and storage. I've noticed you've begun asking lots of question all over this forum. And you create a thread for each question. No offense, but that is not how this forum works. I strongly suggest you take your questions there. 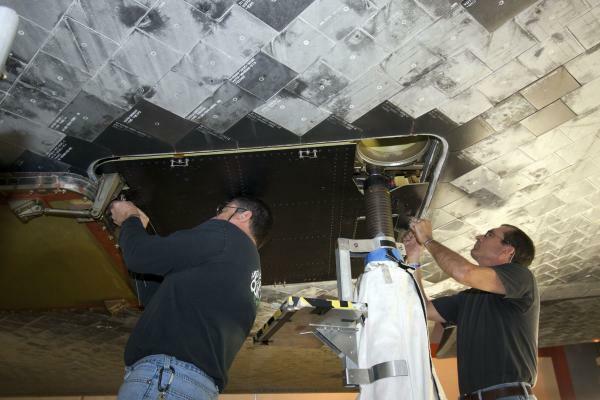 SpaceHAB related question: On which missions was either or both of the XO576 bulkhead CCTV cameras (A/D) moved to the aft bulkhead of the SpaceHAB? Two missions I'm aware of are STS-95 (both cameras relocated) and STS-107 (camera D relocated the left camera platform of the SpaceHAB), but where there any others? And what was the reason for relocating these cameras? Thanks for the answers. Was there anything special they wanted to keep an eye on during those missions? On a similar tangent: The RMS end effector camera, was it different in any way from the other cameras that were mounted on PTUs? Or was it bog standard, just not mounted on a PTU? Can someone confirm that the forward-most edge of the PLBD forward curvature are located at XO576 and the aft-most edge where they meet the mid-fuselage is at XO582? Thanks for the answers. Was there anything special they wanted to keep an eye on during those missions? On a similar tangent: The RMS end effector camera, was it different in any way from the other cameras that were mounted on PTUs? Or was it bog standard, just not mounted on a PTU? IIRC, the EE camera was mostly bog-standard except that it also had fixed zoom, to avoid confusing the RMS capture cues. The PTU-mounted cameras had variable zoom. Thanks for the answers Jorge. When you say that the EE camera had a fixed zoom do you mean that its FoV couldn't be altered? I'm pretty sure that it could as I have seen EE camera do this on numerous occasions. EDIT: this TM reports these numbers: Forward PLBD apex Xo=574.09, base Xo=579.30. I seem to remember soome footage of a Big Wing Canberra that was going to be monitoring Discovery's descent--flying 'chase'.Anyone have any links? For such a specialized effort, it doesn't look that good. They were apparently having stabilization problems. Anyone know what happened to Atlantis's ET umbilical well doors? They were removed in the OPF and a Ferry Flight Door set was installed in their place but what became of the actual flight ET umbilical well doors? I have attached the very last photo of them after they had been disconnected and removed from the orbiter. And SRM question: The case stiffener rings that were on the aft motor segment, were they pre-installed at the factory or at the launch site? The foam and the large outer rings were just additional covering correct? These were not going to present on the FWC aft motor segments, is this also correct?